Jenna (pictured on the right) weighted 4 pounds 2 ounces and was 17 inches long. Jillian weighed 3 pounds 13 ounces and was 17 and 1/2 inches long. After 57 days on bedrest, Sarah Thistlethwaite finally earned her second and third set of motherhood wings May 9, just in time for Mother’s Day. Just do the math and you’ll see why she’s thrilled to be looking back on an over 2-month hospitalization. She’s been anchored to fetal monitors 20 hours a day since March 14, which, like any good math teacher knows, is also Pi Day (pi day). Her stint on the labor and delivery floor at Akron General Medical Center began shortly after Sarah and her husband, Bill, discovered she was pregnant with monoamniotic twins, a rare condition where the twins share an amniotic sack. When twins share an amniotic sack, there are many risks to monitor. 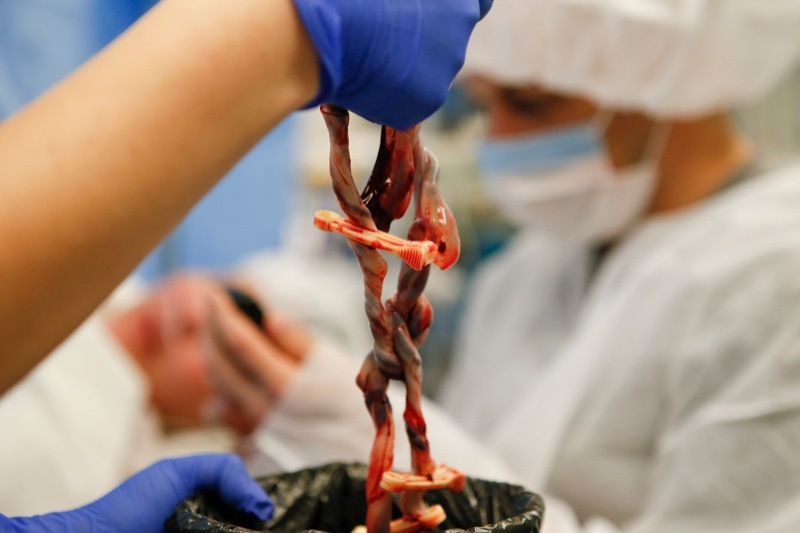 The twins’ umbilical cords can become entangled or compressed. And there’s a risk that one fetus’ cord might wrap around the other one’s neck. WIth with monoamniotic twins, a rare condition where the twins share an amniotic sack, easy for the twins to become entangled in each other’s umbilical cords. Sarah has been through the pregnancy drill before with her 15-month-old son, Jaxon. When she suspected she was pregnant again in October, she took a home pregnancy test to confirm her suspicions. Yet when she arrived at her obstetrician’s appointment, it took a blood test to confirm the pregnancy. She was asked to return every 48 hours for 2 weeks to monitor her blood levels to ensure her pregnancy was progressing. She underwent an ultrasound at 6 weeks, and a yolk sack was detected. A heartbeat was detected at another ultrasound administered at 10 weeks. But it wasn’t until the third ultrasound to check the baby’s gender on Jan. 27, given at 19 weeks and on Jaxon’s birthday, that the Thistlethwaites learned they were having twins. Yet many of their conversations were difficult and unique to couples expecting monoamniotic twins, such as how long could she safely go before being confined to bedrest; how to minimize the impact of a lengthy hospital stay on their young son, really just a baby himself, without compromising the health of their unborn children; and when is the best time to deliver the babies so they don’t harm themselves but have adequate time to mature as much as possible in the womb. Her obstetrician referred her to Dr. Melissa Mancuso, a perinatologist at Akron Children’s Hospital, who helped them navigate those discussions. And Sarah began that long journey in the labor and delivery unit at Akron General Medical Center under the watchful eye of Dr. Mancuso. Sarah had to take a leave from her 8th graders at the Early College Academy at Souers Middle School in Canton, where she teaches math. And her husband, clinical director at Advanced Spine, Joint and Wellness in Medina, started trekking from their home in Orrville to Akron every day after work, often with little Jaxon in tow. Since becoming an inpatient, Sarah has only been away from the hospital once, a jaunt home for a couple of hours on Easter. Not one to let the situation get her down, Sarah has turned what could have been a very negative time into a positive one. Bolstered by the support of friends and family, she used her unexpected free time to teach herself how to knit and to develop friendships with her doctors and nurses, and even other mothers who are ordered on bed rest in the unit. Her room is filled with cards and gifts, and she looks forward to her daily visits with Bill and Jaxon. Those visits are pretty much the only time she can go without her monitors. Once Sarah and Bill decided on May 9 as the date, with the girls at 33-weeks gestation, a countdown chart was created and posted on Sarah’s hospital room wall. The Thistlethwaite family kept track of the days, waiting for their life to return to normal. “Or as normal as life with newborn twins can be,” Sarah said. On May 9, finally the countdown chart read “0 days left.” Sarah’s excitement to meet Jenna and Jillian overruled her nervousness about the procedure as she was wheeled into the operating room, accompanied by Bill. 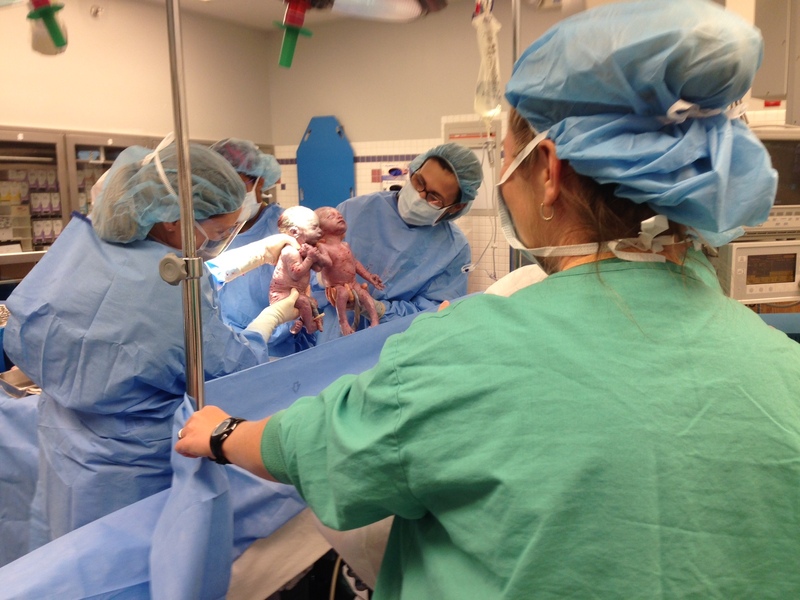 The C-section delivery, performed by Dr. Mancuso and her partner Katherine Wolfe, was quick and precise, and soon 2 beautiful, almost 5-pound babies emerged and greeted the outside world. The neonatologists closely examine and attend to the newborns. Because Jenna and Jillian are premature (any baby born under 35 weeks gestation is considered premature), they are taken directly to the Special Care Nursery, a neonatal intensive care unit operated by Akron Children’s Hospital but located at Akron General Medical Center. Under the careful eye of the Akron Children’s Hospital neonatologists, the twins will probably need 2 to 4 weeks of growing before they’re ready to return to the family’s Orrville home. But Mother’s Day will always be especially significant for Sarah, as the twins’ birthdays will now occasionally fall on that holiday. No double she’ll remember the hurdles the pregnancy presented but also how worthwhile it was to endure that journey. Congrats on your two bundles of Joy! Bed rest is so worth the result in the end I had close to 20 weeks of bed rest with all my babies and they are happy and healthy today! Wonderful job with your little ones the Nicu time will have its moments where it seems to fly by and some days that just drag but all worth them getting home and reaching their milestones. Congratulations again!! I successfully delivered monoamniotic twins 23 years ago. Even though they were born at 32 weeks, my girls just graduated college with honors and are now nurses. While I was monitored continuously (and have the scars from bed sores to prove it! ), I believe the only way I and my babies were delivered from this situation was being extremely positive and lots, and lots of prayers. Congratulations and lots of love being sent your way, the journey begins and I wish you many joys for the years to come.